Beautiful Beach (#046) | Web comic "Surfer Joe"
Not sure who said this or where exactly it came from. It’s printed on a piece of paper that ended up on my desk. On the back of the paper are various sketches and doodles that my daughter Serina drew and gave to me. I liked them so much I decided to keep it around my desk for inspiration. One day I turned the paper over and found this quote. Although I don’t go to fancy hotels and eat in expensive restaurants, I find an odd comfort in this piece of text. It’s probably the reference to “beautiful beaches”… but whatever. 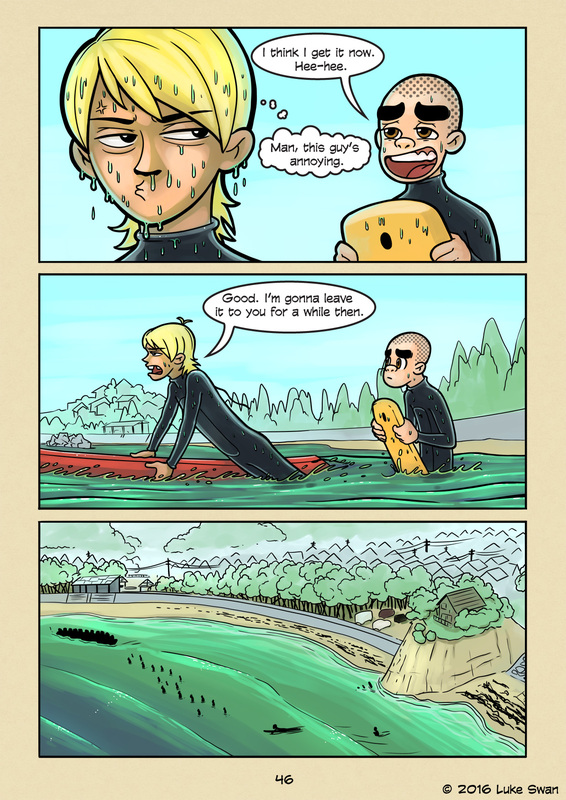 I found it shortly after I left my job to pursue Surfer Joe full time. I keep it as a reminder that work is supposed to be fun. It’s like play for grownups, or at least that’s how it should be. You work harder when you are having fun, and it doesn’t feel like work. If it starts to feel like work it’s time to change things up. It’s been about 6 months since we started our adventure, and I’ve learned a lot so far. The first of which is that starting a business is incredibly hard. The to-do list is insanely long and only keeps growing every day. It’s impossible to keep track of everything, even if you write it all down. It’ll stress you out if you let it. The key is to stay in the moment and take care of your small tasks you set yourself every day. The big picture is scary as all get-out. You have to look at it from time to time, but don’t stare at it too long or you will get lost in the abyss. Small picture when doing tasks. Big picture when you want to see where you’re going.